Scottish giants Rangers cruised to an impressive win over Chilean side Colina, in the Junior Section, at Scroggy Road, Limavady on Tuesday night. A first half brace from striker Faisu Sangare and a super strike from Ciaran Dickson gave the Glasgow youngsters a comfortable lead at the break. 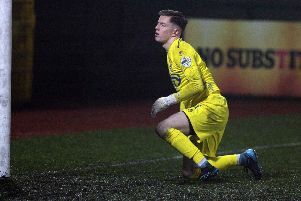 In spite of taking their foot off the gas, Rangers were always in control and second half goals from Kai Kennedy and Simon Millar sealed their first victory in this year’s SuperCup NI. In truth the Scots could have won by a bigger margin as they completed dominated possession, so much so that their keeper Lewis Budinauckas didn’t have a single shot to save in the entire match. In glorious sunshine, Rangers should have raced into a sixth minute lead but Matt Yates headed wide from close range after Darren Watterson’s left wing centre had picked out the unmarked winger at the back post. Rangers took the lead on 12 minutes as the impressive Kai Kennedy saw his left wing cross find Sangare and the big striker headed home past Colina keeper Cristofer Rios. Two minutes later, after another flowing Rangers move Sangare grabbed his second, blasting home from the edge of the box. Rangers added a third on 22 minutes as midfielder Dickson made no mistake firing low into Rios’ bottom right hand corner from 20 yards. Kennedy’s final act before being substituted came in sublime fashion on 42 minutes as his curling free-kick from the right hand edge of the penalty box, flew past Rios and into the net. In the closing stages Rangers should have added a fifth but Allisdair Munro somehow fired wide with the goal at his mercy. Right at the death, Simon Millar completed the rout as he raced clear of the Colina defence, before smashing the ball home past a hapless Rios. Rangers: Lewis Budinauckas, Ciaran Dickson, Kai Kennedy (Simon Millar 42); Kyle McClelland, Murray Millar, Allisdair Munro, Ryan Muir (Callum Biggar HT); Harris O’Connor, Darren Watterson, Matt Yates, Faisu Sangare (Arron Bryson HT). Colina: Cristofer Rios, Felipe Lazo, Rodrigo Vergara, Benjamin Reyes, Simon Diaz (Miguel Montecinos 28), Jesus Bravo (Benjamin Campos 48); Fernando Urzua (Dylan Okiguin 28); Cristobal Valencia, Bastian Puchi, Cristobal Miranda, Felipe Orostica.